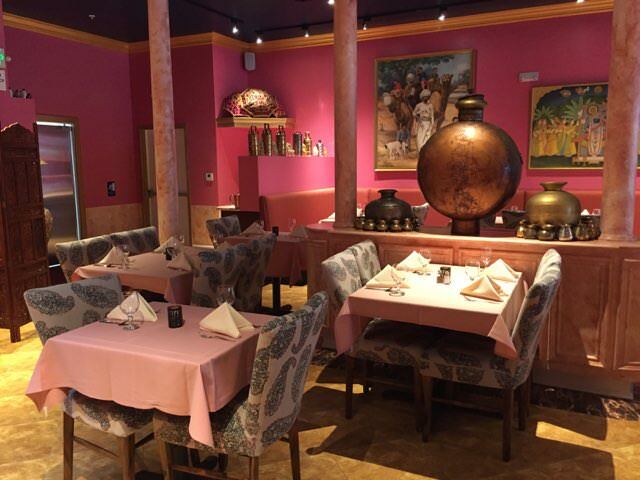 Our newly opened restaurant, Lotus SF Indian Cuisine in San Francisco was featured in ABC7 News the Bay Area's source for breaking news and live streaming video online. New schedule starting February! Lotus SF will be OPEN 7 days a week. New Lunch Menu and an updated Dinner Menu coming in February. We got our alcohol license! We will now be offering beer and wine. Lotus SF is a new earth-friendly Indian restaurant that opened in the Mission District, San Francisco with traditional and sustainable North Indian dishes. 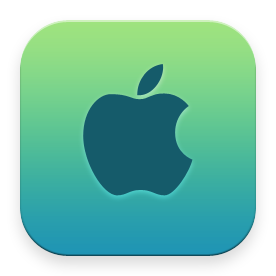 For inquiries call us at (415 872 9130). Our friends at the North Bay Hindu Center invite you to their SANSKRITI 2018 event. 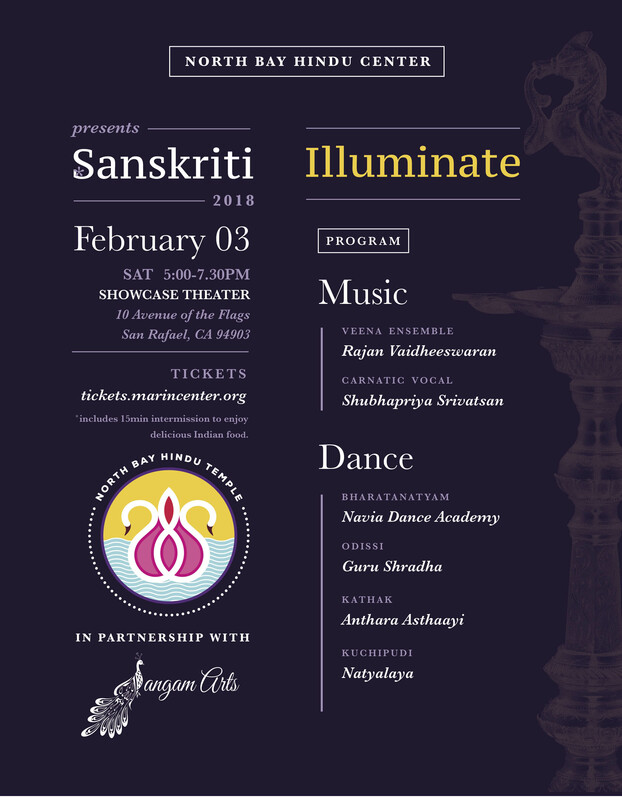 Sanskriti features Indian Classical Music and Dance in partnership with Sangam Arts. Please join us on Saturday, February 3, 2018 at the Marin Showcase Theater in North San Rafael. 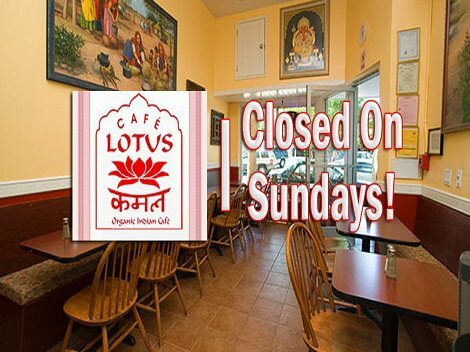 Since January 14, Cafe Lotus will be Closed on Sundays. 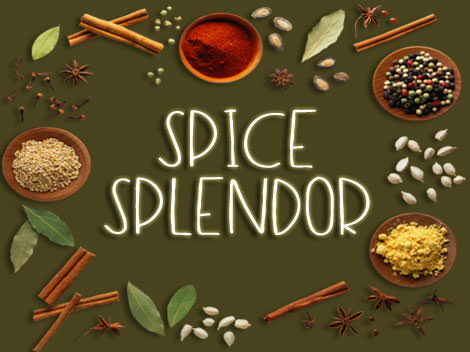 Don't worry, you can still get your favorite Indian food on Sundays at Lotus Cuisine of India, 704 Fourth Street San Rafael and Lotus Chaat and Spices at 1561 4th Street San Rafael. Pacific Sun is Marin County's premier weekly newspaper covering arts, news, events and lifestyle, Tanya Henry of Pacific Sun included Sartaj India Cafe in her Article. Sartaj India Cafe serves healthy Indian food made from sustainable, local and organic ingredients in Sausalito, Marin County. 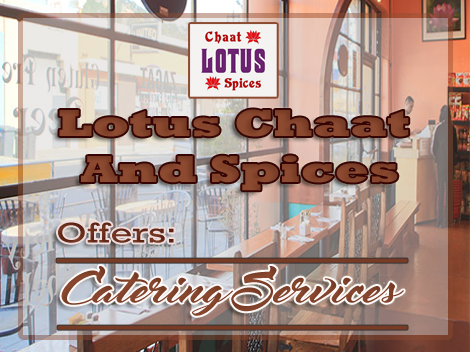 Did you know that Lotus Chaat and Spices offers Catering Services? Lotus Chaat caters for large parties and events! 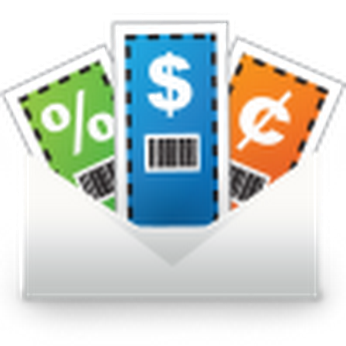 You can place your orders by calling us at 415 454-6887 or Contact us online. 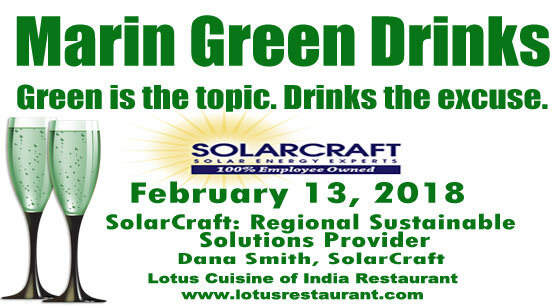 Come and join us in our next Marin Green Drinks business mixers on Tuesday, February 13 at Lotus Cuisine of India Restaurant. Dana Smith from Solar Craft is our guest speaker. His topic is "SolarCraft: Regional Sustainable Solutions Provider"
Join us with our host, Lotus Cuisine of India, a certified green business restaurant in Bay Area. See you on February 13 at 5:30 PM. Bring business cards, a colleague or friend. 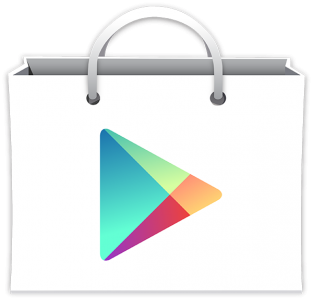 Thank you, Val Lewis for your kind review on Google! "Delicious food. Try the Lamb Saab and Pesto Naan! 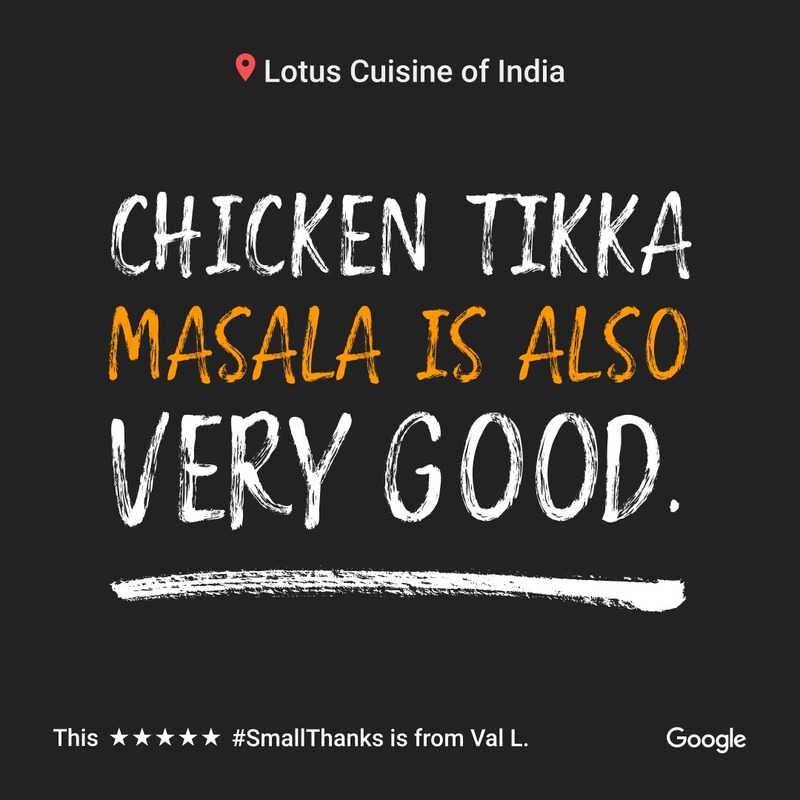 Chicken Tikka Masala is also very good. 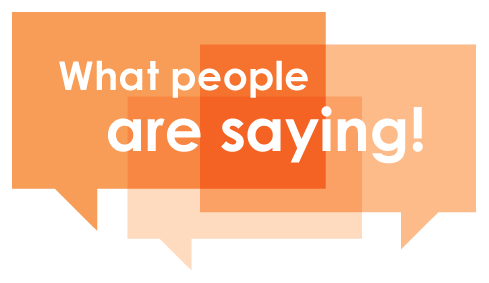 Service was attentive and friendly - everything served with a smile! The decor is beautiful."